Ali al-Qaradaghi is the secretary-general of the Qatar-based International Union of Muslim Scholars (IUMS), an organization previously led by Yusuf al-Qaradawi and linked to the Muslim Brotherhood.“International Union of Muslim scholars ‘rejects normalisation with Israel and calls for release of prisoners of conscience,’” Middle East Monitor, November 9, 2018, https://www.middleeastmonitor.com/20181109-international-union-of-muslim-scholars-rejects-normalisation-with-israel-and-calls-for-release-of-prisoners-of-conscience/; Ali Abdelaty and Aziz El Yaakoubi, “Islamist group rejects terrorism charge by states boycotting Qatar,” Reuters, December 1, 2017, https://www.reuters.com/article/gulf-qatar/islamist-group-rejects-terrorism-charge-by-states-boycotting-qatar-idUSL8N1O12V8. Qaradawi allegedly handpicked Qaradaghi as secretary-general of the IUMS.Qatarileaks, Twitter post, May 24, 2018, 2:49 p.m., https://twitter.com/qatarileaks/status/999723958457921537. Qaradaghi has defended Qaradawi from accusations of supporting terrorism, though both have been vocal advocates for the Muslim Brotherhood and Hamas.Hassan Obeid, “Qaradaghi: We support action against Houthis,” Al-Monitor, April 19, 2015, https://www.al-monitor.com/pulse/originals/2015/04/palestine-international-union-of-muslim-scholars-alqaradaghi.html. Qaradaghi holds a PhD in Islamic jurisprudence and has written dozens of books on Islamic finance. He resides in Qatar, where he is on the faculty of Qatar University.“Curriculum Vitae,” Qaradaghi.com, accessed December 4, 2018, http://www.qaradaghi.com/Details.aspx?ID=4. He also sits on the sharia advisory boards of multiple financial institutions.“Shari’ah Board,” Qatar First Bank, accessed December 6, 2018, https://www.qfb.com.qa/about-us/shariah-board/; Anjuli Davies, “High-profile Islamic finance firm Dar Al Istithmar closes,” Reuters, January 29, 2013, https://www.reuters.com/article/islamic-finance-dar/high-profile-islamic-finance-firm-dar-al-istithmar-closes-idUSL5N0AYD5C20130129; “Curriculum Vitae,” Qaradaghi.com, accessed December 4, 2018, http://www.qaradaghi.com/Details.aspx?ID=4. 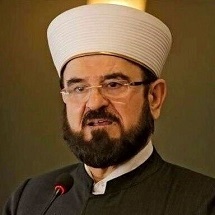 Qaradaghi was re-elected as secretary-general of the IUMS in November 2018.“International Union of Muslim scholars ‘rejects normalisation with Israel and calls for release of prisoners of conscience,’” Middle East Monitor, November 9, 2018, https://www.middleeastmonitor.com/20181109-international-union-of-muslim-scholars-rejects-normalisation-with-israel-and-calls-for-release-of-prisoners-of-conscience/. Qaradaghi’s website, www.qaradaghi.com, includes speeches, lectures, and links to his social media accounts. He is active on multiple social media platforms and professes social media plays an important role in the spread of Islam, though “jihad is the greatest way to spread Islam.”“Social media is very important to spread Islamic cause Kaynak: Social media is very important to spread Islamic cause,” Çınarın Sesi, October 16, 2018, http://www.cinarinsesi.com/social-media-is-very-important-to-spread-islamic-cause-159258h.htm. Qaradaghi has been critical of the United States, and the West in general, over perceived anti-Muslim foreign policy. He called for a “Palestinian, Arab and Islamic uprising” against the United States after President Donald Trump’s 2017 announcement of U.S. intentions to move its embassy in Israel from Tel Aviv to Jerusalem.Hussein Qabani, “Scholars urge ‘uprising’ over Jerusalem embassy move,” Anadolu Agency, February 25, 2018, https://www.aa.com.tr/en/middle-east/scholars-urge-uprising-over-jerusalem-embassy-move/1073366. Qaradaghi has accused Israel of “ongoing crimes against humanity”Idris Okuducu and Dishad Saifaalddin Ahmed, “Qatar-based Muslim group decries Israel's Gaza violence,” Anadolu Agency, May 15, 2018, https://www.aa.com.tr/en/middle-east/qatar-based-muslim-group-decries-israels-gaza-violence/1146479. and labeled the United States and Israel “partners in crime.”Idris Okuducu and Dishad Saifaalddin Ahmed, “Qatar-based Muslim group decries Israel's Gaza violence,” Anadolu Agency, May 15, 2018, https://www.aa.com.tr/en/middle-east/qatar-based-muslim-group-decries-israels-gaza-violence/1146479. Qaradaghi has called for the Muslim world to unite against Israel to restore pre-1948 Palestine.“Muslim scholars body urges focus on Palestinians’ right,” Anadolu Agency, May 14, 2018, https://www.aa.com.tr/en/middle-east/muslim-scholars-body-urges-focus-on-palestinians-right/1144330. He has also defended Hamas as “defending the rights of the nation….”Hassan Obeid, “Qaradaghi: We support action against Houthis,” Al-Monitor, April 19, 2015, https://www.al-monitor.com/pulse/originals/2015/04/palestine-international-union-of-muslim-scholars-alqaradaghi.html. After the 2016 attempted coup in Turkey, Qaradaghi excoriated Western powers for failing to side with the Turkish government, which he defended as a protector of the “weak and oppressed.”Tasneem al-Nekheli, “Muslim scholars slam western stance on Turkey coup bid,” Anadolu Agency, July 27, 2016, https://www.aa.com.tr/en/anadolu-post/muslim-scholars-slam-western-stance-on-turkey-coup-bid/616964. More than 300 people were killed during the coup attempt and the Turkish government’s subsequent military crackdown. Turkish President Recep Tayyip Erdogan arrested or detained more than 40,000 alleged dissidents, prompting international criticism.Thomas Grove, “Turkey Broadens Post-Coup Purge,” Wall Street Journal, July 18, 2016, https://www.wsj.com/articles/alleged-coup-leaders-appear-in-court-in-ankara-1468846241; Tim Arango and Ceylan Yeginsu, “Turkey to Release Tens of Thousands of Prisoners to Make Room for Coup Suspects,” New York Times, August 17, 2016, https://www.nytimes.com/2016/08/18/world/europe/turkey-prisoners-erdogan.html. Founded in 2004 by clerics reportedly tied to the Muslim Brotherhood, the IUMS has received international criticism for ties to terrorism.Ali Abdelaty and Aziz El Yaakoubi, “Islamist group rejects terrorism charge by states boycotting Qatar,” Reuters, December 1, 2017, https://www.reuters.com/article/gulf-qatar/islamist-group-rejects-terrorism-charge-by-states-boycotting-qatar-idUSL8N1O12V8. Former IUMS president Qaradawi is an unofficial spiritual leader of the Muslim Brotherhood.“Al-Qaradawi turns down top Brotherhood post,” Al Jazeera, January 12, 2004, http://www.aljazeera.com/archive/2004/01/2008410145045889729.html; Malek Harb and Jon Gambrell, “Arab nations add names to terror list amid Qatar dispute,” Associated Press, June 9, 2017, https://apnews.com/0f252c487b7b431682a3555f68703eeb. Qaradaghi has described Qaradawi as a moderate opposed to extremism, though Qaradawi has been outspoken in his support of suicide bombings.“French visa ban blow to Al Qaradawi,” Gulf News, March 27, 2012, https://gulfnews.com/world/gulf/qatar/french-visa-ban-blow-to-al-qaradawi-1.1000137. In 2012, Hamas leader Ismail Haniyeh joined the IUMS in a bid to elevate Hamas’s international profile.“Hamas Leader Haniyah Joins Emerging Network of Islamists,” AccessADL, February 10, 2012, http://accessadl.blogspot.com/2012/02/hamas-leader-haniyah-joins-emerging.html. In late 2017, Saudi Arabia, Egypt, the United Arab Emirates, and Bahrain designated the IUMS a terrorist organization.“Doha-based Muslim scholars group slams 'terror' claims,” Anadolu Agency, December 1, 2017, https://www.aa.com.tr/en/middle-east/doha-based-muslim-scholars-group-slams-terror-claims/987063. The UAE had previously designated the IUMS in 2014.“Islamist group rejects UAE terrorism designation,” Reuters, November 17, 2014, https://ca.reuters.com/article/topNews/idCAKCN0J10RX20141117. Qaradaghi has defended the IUMS as focused on peace and independent of any country or NGO.Mazin Majeed Asaad Baqal and Hemn Baban, “Int'l Muslim Scholars Union opens office in N. Iraq,” Anadolu Agency, August 13, 2018, https://www.aa.com.tr/en/middle-east/intl-muslim-scholars-union-opens-office-in-n-iraq/1230039. According to Qaradaghi, the IUMS grew out of the Muslim ummah (community) and rejected “extremist ideologies that have tried to hijack and distort our peaceful religion.”“Doha-based Muslim scholars group slams 'terror' claims,” Anadolu Agency, December 1, 2017, https://www.aa.com.tr/en/middle-east/doha-based-muslim-scholars-group-slams-terror-claims/987063. Qaradaghi later announced the IUMS’s intention to press for legal action to overturn the designation.Agence France-Presse, “Qatar-based Muslim group to sue over 'terror' label,” The Express Tribune (Karachi), December 1, 2017, https://tribune.com.pk/story/1573955/3-qatar-based-muslim-group-sue-terror-label/. Ali al-Karadaghi“FBI untersucht Ermordung der muslimischen Studenten,” Spiegel Online, February 13, 2015, http://www.spiegel.de/politik/ausland/mord-an-muslimen-in-chapel-hill-fbi-untersucht-a-1018464.html. Ali Al-Qaradaghi“Siege by Muslim states on another is ‘forbidden,’ say scholars,” Middle East Monitor, June 13, 2017, https://www.middleeastmonitor.com/20170613-siege-by-muslim-states-on-another-is-forbidden-say-scholars/. Ali Al-Qaraghi“Denounced arbitrary arrest, detention, the secret trials and Unjust imprisonment of Muslim clerics,” International Union of Muslim Scholars, September 6, 2018, http://www.iumsonline.org/en/ContentDetails.aspx?ID=8761. Ali Al-Quradaghi“2013 Report on International Religious Freedom,” U.S. Department of State, July 28, 2014, https://www.state.gov/j/drl/rls/irf/2013/nea/222309.htm. Ali Al-Qurra DaghiRobert Spencer, “Keith Ellison’s Hamas Ties,” Front Page Magazine, December 22, 2016, https://www.frontpagemag.com/fpm/265223/keith-ellisons-hamas-ties-robert-spencer. Ali Mohieddin al-QaradaghiDali al-Qaradaghi, YouTube page, accessed December 3, 2018, https://www.youtube.com/channel/UCSEE7xhslfNYYbIC4Hub_6g?app=desktop. Ali Mohiuddin Al QaradaghiIrfan Bukhari, “Blockade unethical and un-Islamic: Seminar,” The Peninsula (Doha), September 29, 2017, https://thepeninsulaqatar.com/article/29/09/2017/Blockade-unethical-and-un-Islamic-Seminar. Ali Muhiddin al-KaradaghiMairbek Vatchagaev, “Salafist-Sufi Tensions Threaten Greater Instability in North Caucasus,” Jamestown Foundation, June 11, 2015, https://jamestown.org/program/salafist-sufi-tensions-threaten-greater-instability-in-north-caucasus-2/. Ali Muhiddin al-QaradaghiMairbek Vatchagaev, “Qatari Sheikh Becomes Tool for Kremlin in Struggle Against North Caucasus Militants,” Jamestown Foundation, November 13, 2014, https://jamestown.org/program/qatari-sheikh-becomes-tool-for-kremlin-in-struggle-against-north-caucasus-militants-2/. Ali Muhiuddin Al-Qurra Daghi“Secretary General of the International Union of Muslim Scholars Ali Muhiuddin Al-Qurra Daghi,” Getty Images, April 12, 2017, https://www.gettyimages.com/detail/news-photo/secretary-general-of-the-international-union-of-muslim-news-photo/668016084. Ali Muhyi ad-Din al-Qaradaghi“DAGESTAN - DAR AL-SALAM -- FATWA BY SHAYKH ALI AL-QARADAGHI,” Islam.ru, December 5, 2012, http://islam.ru/en/content/news/dagestan-dar-al-salam-fatwa-shaykh-ali-al-qaradaghi. Ali Qara Daghi“Qara Daghi congratulates the Islamic nation on the occasion of Eid al-Fitr,” International Union of Muslim Scholars, May 23, 2017, http://www.iumsonline.org/en/ContentDetails.aspx?ID=7089. Dali al-QaradaghiDali al-Qaradaghi, YouTube page, accessed December 3, 2018, https://www.youtube.com/channel/UCSEE7xhslfNYYbIC4Hub_6g?app=desktop. Ali al-Qaradaghi is the secretary-general of the Qatar-based International Union of Muslim Scholars (IUMS), an organization previously led by Yusuf al-Qaradawi and linked to the Muslim Brotherhood. “We view Hamas from the perspective of the Palestinian cause, which must remain the pre-eminent cause not just for the union but for all Arabs, Muslims and free humanitarians of the world. We stand against oppression, tyranny, displacement and detention tactics that Israeli occupation forces rely upon; this is a humanitarian and international stance. Hamas is defending the rights of the nation, and the nation must stand by those who defend its pre-eminent cause.”Hassan Obeid, “Qaradaghi: We support action against Houthis,” Al-Monitor, April 19, 2015, https://www.al-monitor.com/pulse/originals/2015/04/palestine-international-union-of-muslim-scholars-alqaradaghi.html. “Every Muslim should contribute to the Intifada that started for the sake of al-Aqsa and Palestine.” (Tweet)Maayan Lubell and Nidal al-Mughrabi, “Israeli forces shoot dead five Palestinians as violence rages on,” Reuters, October 10, 2015, https://www.reuters.com/article/us-israel-palestinians/israeli-forces-shoot-dead-five-palestinians-as-violence-rages-on-idUSKCN0S319U20151010. “Racist propaganda against so-called ‘Islamic terrorism’ may have helped him reach power, but it will only serve to polarize Americans later. Playing on the public’s emotions and reviving racial prejudices will lead to destruction.” (Tweet)Ahmed al-Masri, “Muslim scholar warns Trump against ‘racist’ remarks,” Anadolu Agency, January 20, 2017, https://www.aa.com.tr/en/americas/muslim-scholar-warns-trump-against-racist-remarks/731542. “They overthrew Morsi on charges of collaborating with Hamas and Qatar and then besieged Qatar on charges of supporting Hamas, Gaza, Jerusalem and the Palestinian cause. This is the charge!” (Tweet)Ali al-Qaradaghi, Twitter post, June 6, 2017, 4:34 p.m., https://twitter.com/aliqaradaghi/status/872190058626985987. “They want to bend and bow to Qatar as they undergo and kneel and not to support the people of Gaza and to raise their hand from the Palestinian cause to be singled out by Zionist Arabs and Jews!” (Tweet)Ali al-Qaradaghi, Twitter post, June 6, 2017, 4:41 p.m., https://twitter.com/aliqaradaghi/status/872191771773743104. Statement on the U.S. decision to relocate its embassy in Israel from Tel Aviv to Jerusalem: “This attempt to invade is not acceptable and totally illegal. The trick of ‘the Palestinian issue should be solved within the framework of legal rights and international observers,’ should come to an end.”“Al-Quds is the cause of the Ummah nation,” Çınarın Sesi, February 27, 2018, http://www.cinarinsesi.com/al-quds-is-the-cause-of-the-ummah-nation-143002h.htm. “We call for a Palestinian, Arab and Islamic uprising against this American aggression. Jerusalem is the cause of [our Muslim] nation and abandoning it or changing its identity will be a disgrace.”Hussein Qabani, “Scholars urge ‘uprising’ over Jerusalem embassy move,” Anadolu Agency, February 25, 2018, https://www.aa.com.tr/en/middle-east/scholars-urge-uprising-over-jerusalem-embassy-move/1073366. “Most Arab leaders remain silent, while some even stand by the Zionists and support U.S. and Israeli policies. The Muslim, Arab and international community must act in coordination against the Zionist regime; the criminals must be brought to justice.”Idris Okuducu and Dishad Saifaalddin Ahmed, “Qatar-based Muslim group decries Israel's Gaza violence,” Anadolu Agency, May 15, 2018, https://www.aa.com.tr/en/middle-east/qatar-based-muslim-group-decries-israels-gaza-violence/1146479. We call on the Arabs, Muslims and the international community to stop Zionist arrogance” (Tweet)Ali al-Qaradaghi, Twitter post, July 14, 2018, 3:54 p.m., https://twitter.com/aliqaradaghi/status/1018222253157298176. “Social media is very important for the spread of the Islamic cause. Allah has commanded us to perform jihad and jihad is the greatest way to spread Islam [Tablikh].”“Social media is very important to spread Islamic cause Kaynak: Social media is very important to spread Islamic cause,” Çınarın Sesi, October 16, 2018, http://www.cinarinsesi.com/social-media-is-very-important-to-spread-islamic-cause-159258h.htm. “The sanctity of blood must be preserved against murder and fighting among Muslims, and assaults on the lives, money and honour should be criminalised.”Mazin Majeed Asaad Baqal and Hemn Baban, “Int'l Muslim Scholars Union opens office in N. Iraq,” Anadolu Agency, August 13, 2018, https://www.aa.com.tr/en/middle-east/intl-muslim-scholars-union-opens-office-in-n-iraq/1230039.